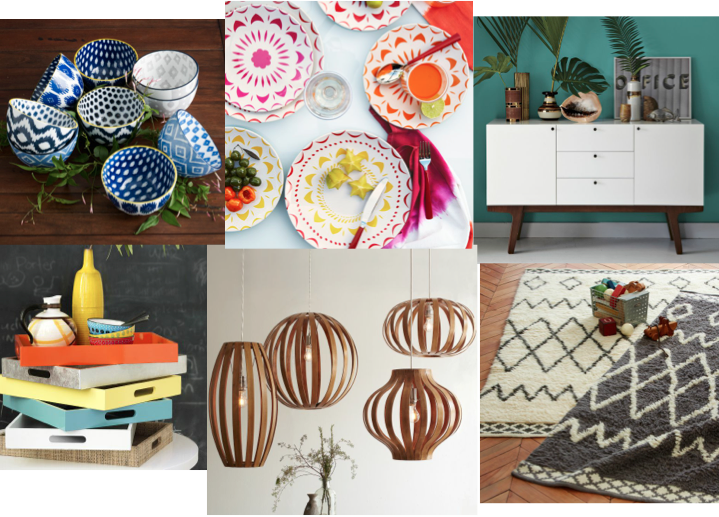 Have you checked out West Elm lately? They have really upped their game when it comes to home furnishings, furniture, and accessories. Known for their affordability, West Elm has really outdone themselves and become a go to resource for modern-day style. Their catalogs are beautifully colorful and inspiring, and with many designer collaborations and a “design lab” feature on their website they are a great resource for stylish living. These items are a few of my favorites right now. Their housewares and accessories come in so many gorgeous patterns and vibrant colors in everything from indigo to neon. I mean those bowls! Their lighting collection has a wide range of styles but I especially love these geometric wood pendants. They are so stylish and chic with a little softer edge to the industrial look. I can’t get enough of their mid-century style furnishings and the Dumont Buffet is one of my favorites with it’s clean lines and timeless modern flare. I also love the way that they accessorize their pieces, giving you an idea on how to mix pieces and styles. Fun and affordable accessories like their acrylic trays make a perfect gift or decorative accessory, and rugs, oh their rugs are amazing!! Check them out today and sign up for their catalog – it’s a monthly inspiration delivered at your doorstep and one of my favs!